I am always surprised how many practitioners of magick are not aware of this awesome stuff because it is so useful in protection, purification and cleansing rites. I look at it as an essential weapon in my arsenal. The only way someone might have issues with using Cascarilla would be if they are strict Vegans and do not like to even touch any animal byproducts. Cascarilla is powdered egg shell. The shells are so finely ground that it feels as soft as baby powder. Some of the more dedicated ritualists make their own cascarilla but doing so is a lot of work and the process of making it creates a mess that is hard to clean up! If you would rather buy your cascarilla, you’ll find it at any Botanica and in most stores that cater to New Agers and Magick practitioners. 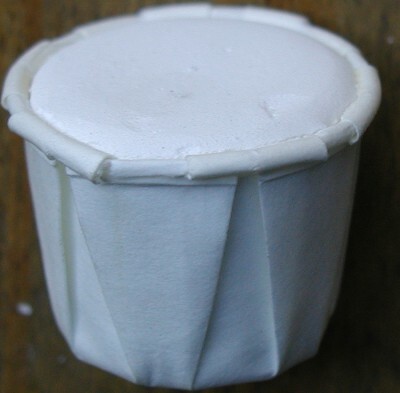 You will usually find it sold packed into what I call a “ketchup cup.” When removed from the cup, it maintains it’s cup form and can be used as one would use a soft piece of chalk. Or, if mixed with water, you will find that the soft-chalk dissolves easily with no residue left behind. Cascarilla repels negative energy, and the vibration of negative energy. 2. As a piece of chalk to draw sigils, and circles of protection for Magickal rituals. 3. This is great to have if you are going to meditate, astral project or perform visualizations. You can use it as a powder and “dust” yourself with it or you can use it as a chalk and make the sign of the cross on different areas of your body (back of neck, forehead, temples, hands, chest and bottom of feet). 5. Cascarilla also keeps non-corporeal beings (spirits, ghosts, demons, etc) away from you! * If you feel like your home may be haunted, this would be a very good repellent (after a thorough house cleansing!!). Be warned–if you have spirits around that you like talking to, you may find it more difficult to communicate with them! Cascarilla does not discriminate between good and evil–it just provides a barrier between the physical and non-physical world. 6. House protection (inside the home): use as a piece of chalk. * Going around the house clockwise, etch the sign of the cross on either side of the door, above the door and on the threshold. When doing the windows–do above, below, and both sides of the window. Do this with all doors and all windows of the home. There are several other uses for Cascarilla, but these are the main uses. If you like, you can check back with me. I’ll be adding directions for different cleansings, rituals, and purification rites, some of which will include the use of Cascarilla. * Using several cups of Cascarilla, walk outside. * Holding the Cascarilla in your hand, begin by crushing a line across the threshold (bottom of the door). * Continue the line from the threshold as you begin to walk clockwise around the perimeter of the house. * you will continue to crush up the chalk as you walk; leaving a fine trail of dust as you walk. * You will go all of the way around the home until you end up back at the front door. * This ritual is best done after a house cleansing. * With this ritual, you are creating a barrier. Meaning: whatever is inside that house, is staying there until the barrier weakens and dissipates or other rituals are performed. * No, rain does not effect this barrier. The barrier begins physical but changes and makes a spiritual/energetic barrier. * This barrier does not last forever. Energy changes, the barrier will weaken. Perform this regularly (just like with cleansings) to keep the barrier strengthened. ** As you walk the perimeter, visualize creating a line of protection from all negativity, negative entities, poverty, sadness, etc. * I say prayers as I walk the perimeter (but I am Catholic and, of course, we Catholics love our prayers!). If your belief system calls God by another name and you have chants or prayers you use–speak them as you walk the perimeter. It is up to you. Your choice and your comfort level are in your energy and that energy is helping to provide protection for the home. ** Aside from visualizing the creation of a wall and saying prayers, I also think of allowing all that is good, happy, and prosperous through this barrier. (and once I’m done with my line of defense, I’ll most likely take another mixture of herbs designed to bring wealth, happiness and love to my home and sprinkle it on top of the Cascarilla ! ).